Legend Cottage is specially arranged to accommodate people who prefers privacy and a peaceful atmosphere. A separate En-Suite bedroom with its own entrance is also available and caters for bed and breakfast. 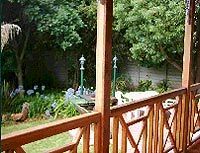 Legend Cottage is central to Gauteng and is situated next to the Ben Schoeman (R28) Highway between Pretoria and Johannesburg, with a 45 minute drive to Johannesburg, 15 minute drive to Pretoria and 35 minute drive from the Johannesburg Airport. Our accommodation caters both for a single person or a family of a maximum of 4 people. For those with a baby there is a baby cot available on request. A small cozy garden with a barbeque area is also part of the package for relaxation after a busy day. The Cottage is situated within 2-20 km reach of shops, Unitas Hospital, clinics, movie theatres, golf courses, Supersportpark Cricket Stadium, restaurants and many more. Casino's etc. are within 20 to 200 km surrounding of the cottage. * The Cottage has it's own entrance with secure parking in front of the Cottage and Bedroom, where a big tree offers cool shading. * Under cover parking can also be arranged.